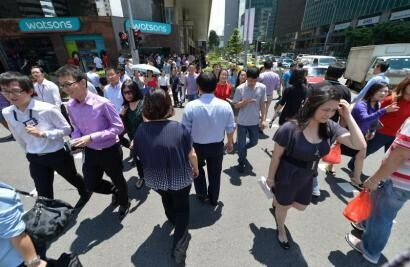 SINGAPORE - While many managers are looking to switch jobs, the situation is particularly dire in the production and manufacturing sector, where a large majority say they are looking for job opportunities elsewhere. The biggest carrot? The draw of perceived higher financial rewards. A survey by British-based leadership institute Roffey Park, released yesterday, found that 63 per cent of the 683 managers surveyed across various sectors of Singapore's economy were looking for new jobs. Of those with itchy feet, 41 per cent cited insufficient financial rewards as the top reason for considering a move in the near future, while the others pointed to a lack of appreciation (36 per cent) and poor management (35 per cent). The survey also found that the push for those in the private sector lay in the lack of financial rewards, while those in the public sector were more concerned by a lack of career growth and development. The production and manufacturing sector was the most vulnerable to a talent exodus, with 79 per cent of managers - the highest proportion, compared with other industries - saying they wanted to move from their current jobs. Having such demotivated managers within the sector, said human resource experts, could be detrimental to the firms in it - at a time when it is already squeezed by a manpower crunch and skyrocketing rentals. Mr James Wallace, associate director for supply chain and procurement at Hudson Singapore, said that demotivated employees could have "a negative impact across the organisation, especially if they are at a management level". After all, junior employees look to managers for direction, he explained. Ms Liu Yiling, manager of engineering at Robert Walters Singapore, said: "Companies will have to be prepared for possible reduced productivity among employees." That would be the case if employees lack the motivation to work. Moreover, high turnover of trained staff could prompt firms to consider cutting back on training or the development of new talent in order to save costs, noted Mr Michael Smith, country director of Randstad. However, this is not something they can truly "afford" to do, he stressed, adding that today's employment market is one where "skilled talent is in short supply and the demands placed on employees are particularly high". To try to keep staff happy and increase talent retention, Roffey Park chief executive Michael Jenkins suggested that firms could look at options such as improving the quality of leadership and career prospects for employees. Financial rewards, he conceded, could be difficult to adjust upwards. He said: "If leaders and organisations do not take the necessary steps to stem the talent outflow, ultimately, it will be difficult to maintain competitiveness, and they will have to resign themselves to mediocrity." Still, experts sounded a warning to individuals looking to change their jobs. "In the long term, candidates who switch companies frequently negatively affect their own reputations and earning potential, because future employers might not want to take a risk by hiring a job-hopper," said Mr Wallace.